Searching for Bonobo in Congo » Who Is Ashley Vosper and Where Is He Going? 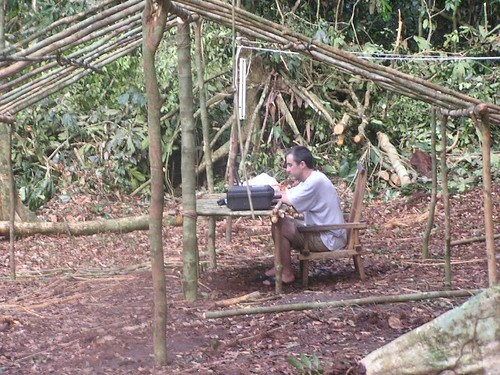 Ashley working on his laptop under an unfinished hut. Ashley is an unpresuming Brit , who understates most everything and speaks in a heavy “brogue”. He disagrees. Smiling sweetly he says its “blarney” not “brogue”. Anyway the rest of us are always saying “What? Would you repeat that one“. Here in Kinshasa, the capital, however, the language challenge for Ashley is French. Hard to get by without it. Ashley’s deformation of the simplest French phrases would raise the hair on a Parisian cat. But, however he talks, and really it is not too much, Ashley is the right person for this job. The job: exploration of the least known track of forest in Congo. Where? Dead center: Congo’s darkest heart, south of Kisangani, west of the Lualaba River, 250 km east of the largest forest park on the African continent: Salonga National Park. Ash will explore this equatorial forest drained by the Lomami River , mystery forest. No reports – even from colonial times – just google map satellite images. 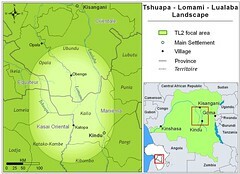 Why are no more people living along the Lomami? Why is this blanket of forest so unknown? Well, no roads. And there has never been much population there, so missionaries never got established. Not enough souls to save. No missionaries means no airstrips, no schools, no health care. But the truth is we don’t know why there are so few people there. Why didn’t the government put in health care and elementary schools? Those basic institutions would have brought more people. True, but the government never has made that sort of investment. One explanation is that it has never had the chance. There was war at independence, a war that lasted years. And there was war from the mid-90s right through the first half-decade of this century. But another explanation is that it wasn’t a priority… there were plenty of other priorities in what was a failing economy and a failing nation-state. Maybe that will change now. Maybe. There’s a new Congolese government, just elected at the end of last year-2006. But no waiting, the area has hardly been touched by the 20th century let alone the 21st and now is the time for exploration. Ashley already has the satellite phones, compasses, GPS’s and malaria cures ready… The outboard has been bought. All that is needed is a huge dugout. Last purchase, we’ll make it next week in Kisangani. And of course, we’ll post the photo. This entry was written by Terese Hart, posted on 2007-05-21 at 9:12 pm, filed under About the project. Bookmark the permalink. Follow any comments here with the RSS feed for this post. Post a comment or leave a trackback: Trackback URL. Hi Ashley (from your kiwi cousin). Looks like all is going well. We distribute the news. Stay well. Mike Riley. I tried to post a comment on Ape news but I`m not sure it went through. I am the research co-ordinator for Atlantic Whale foundation, I would like to help with your project, we really need to chat about it and see where it stands at the moment and in which direction you want to take it. Please can you contact me via my e.mail as it is easier to discuss things or if you are able to receive phone calls i would really like to speak to you regarding going forward with this project.